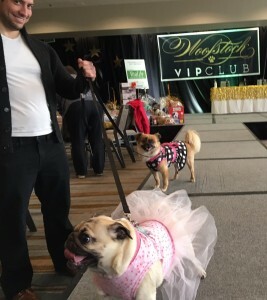 I caught up with some of my favorite Celebrity Pugs at the Woofstock High Tea event. 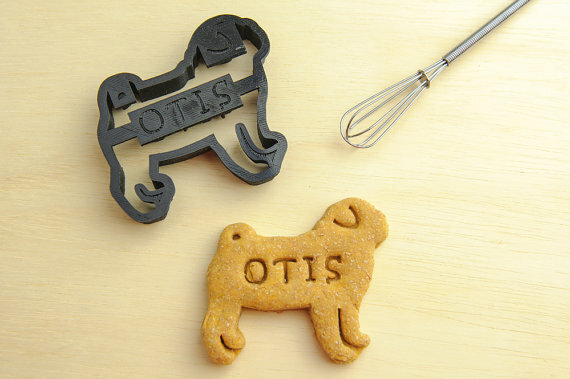 Kilo couldn’t make it out because he’d be more inclined to nibble on his friends than on the many delicious dog-friendly biscuits at the event. That didn’t stop me from bringing home a whole bag of SWAG for him though! A few other pugs entered the contest and strutted their stuff on the dogwalk. 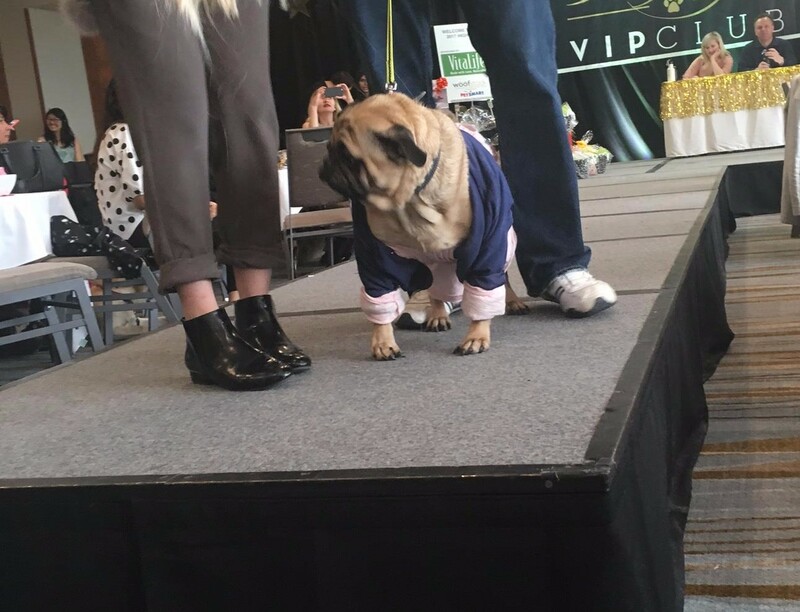 Aura, the gorgeous pug in pink, belongs to Amanda Logan, radio personality and one of the judges for the contest. They had quite the setup! 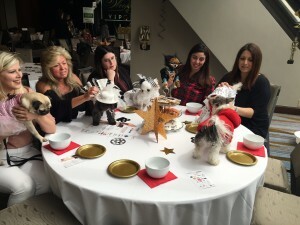 Aura and Amanda with friends at one of the gorgeous tables set up at the event, just look at those outfits! 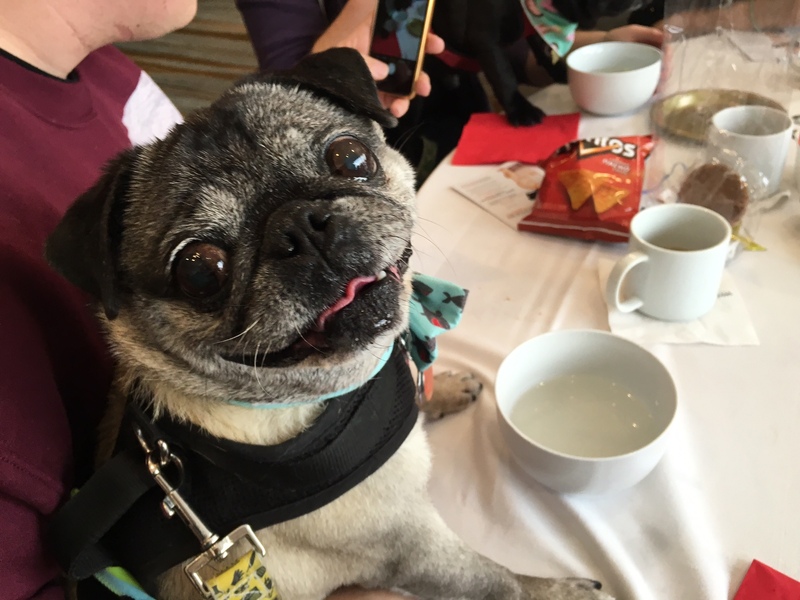 Needless to say the Pugs were in full force at this event, with smiles all around! Will you be at the pug race for Woofstock 2017? Tyson has won the last two years in a row, and he needs some more competition! 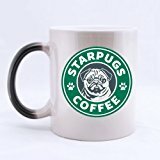 Know of any cool events for pugs? 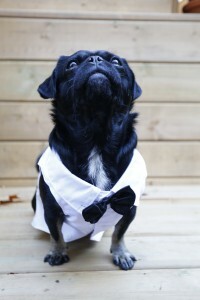 How about Pugoween for PugALug Pug Rescue and our monthly Grumble. We have just launched a new project called Kids’ Pet Club to inform and entertain pet-loving kids. Snorting snoring comedic duo Kilo the Pug and the adorable star of The Backseat Barkers, Fishstick the Pug host a series of videos including Dog Song Sing-Alongs and DIY Dogs. 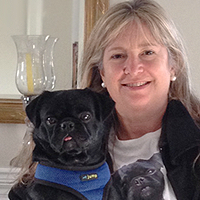 Our adorable rescue pugs help kids learn to count, care for pets, and make all sorts of crafts. 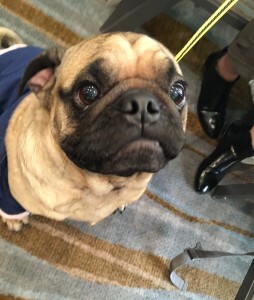 Pugs have such cute, funny, friendly faces with big heads, big anime eyes and big personalities, they make natural hosts. Scientific Research and anecdotal evidence have shown that looking at cute dogs and puppies can help relax children and may also help with focus, processing and memory. We have seen first hand how dogs can make the lives of kids better through Reading, Service Dog and Therapy Dogs Programs. 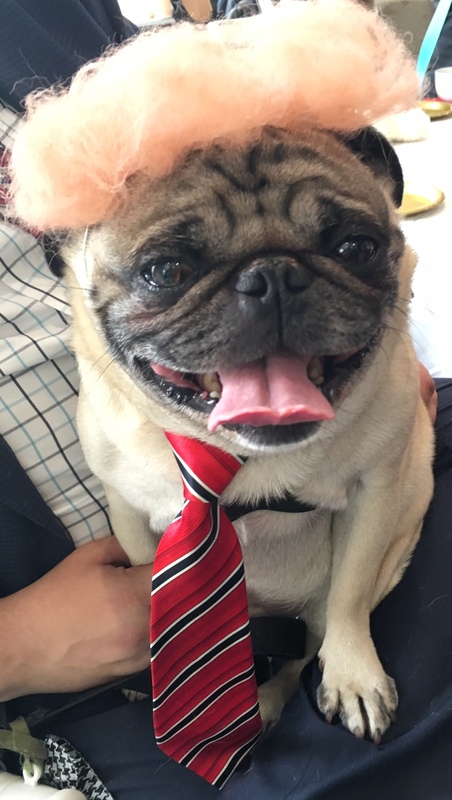 Kilo the Pug certainly brings my daughter and I a lot of joy joy and makes us smile and relax. I’d love to Therapy Work with him in person but he is still too anxious and reactive with strangers and in new places- he would hate it. Through this video series, I can share his little face and help lots of kids without stressing him (he loves the camera as he gets paid in treats and hugs). We have just released the first of the Dog Song Sing-Alongs “Counting to 20 by 2’s”. 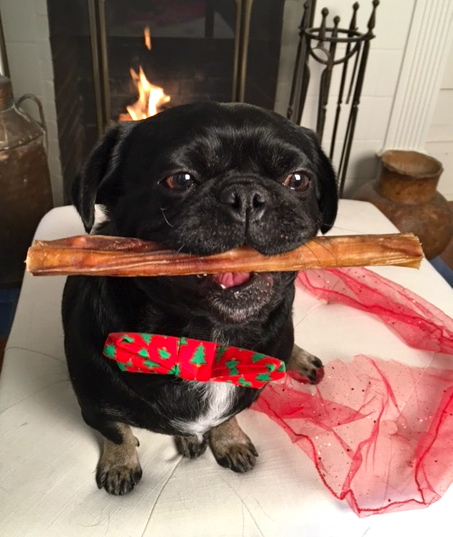 We have another series called DIY Dogs hosted by the Pugs including Crafts like making “DIY Treat Jars” and “DIY Duck Tape Bow Ties”, as well as “Cooking with Kilo (and Fishstick)”. 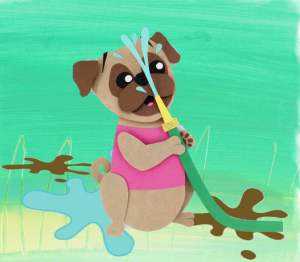 We will also be testing some Sing-Along and Read-Along Videos for the younger pre-school pet-lovers featuring our animated character Penny P Pug which I am very excited about too. 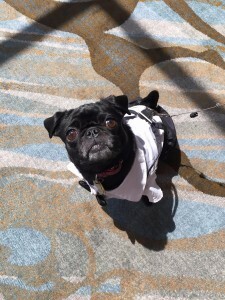 Penny P is a whimsical, wonderful, impulsive little pug puppy full of energy and enthusiasm. Penny P can’t sit still (except when she is asleep in a heap) and every day is an adventure. She has “things to see and things to do, things to smell and things to chew”. She is easily distracted and frequently has to be reminded “Take a Paws and think things through, then you’ll know just what to do”. 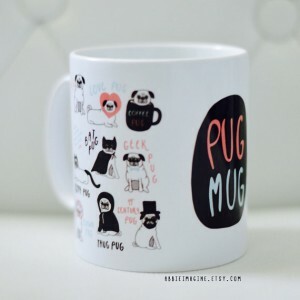 Do you have a Pug that makes you Smile? Tell us in the comments and please share the new videos with any kids you know. 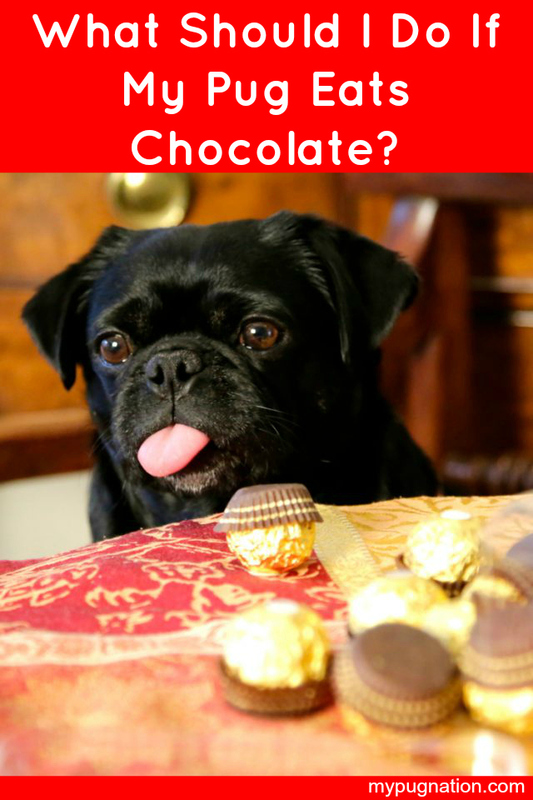 What Should I Do If My Pug Eats Chocolate? Do You Know What To Do If Your Pug Eats Chocolate? 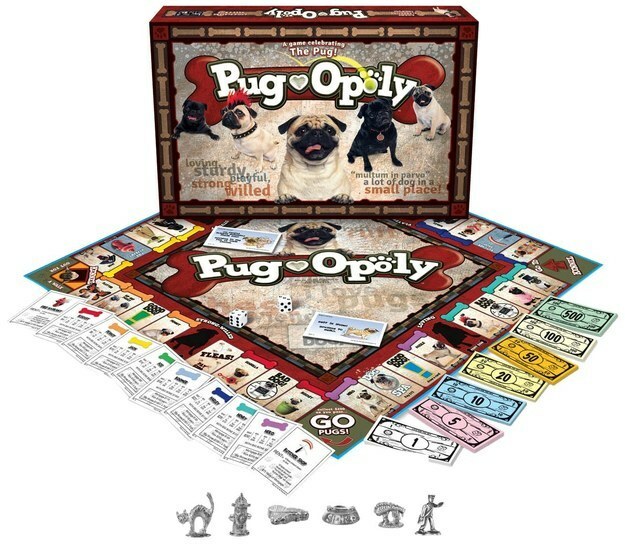 Chocolate is a tasty treat for humans that can be fatally toxic for pugs. It may be one of the most common forms of poisoning in dogs, so it’s vital to know what to do if it happens to your pug. 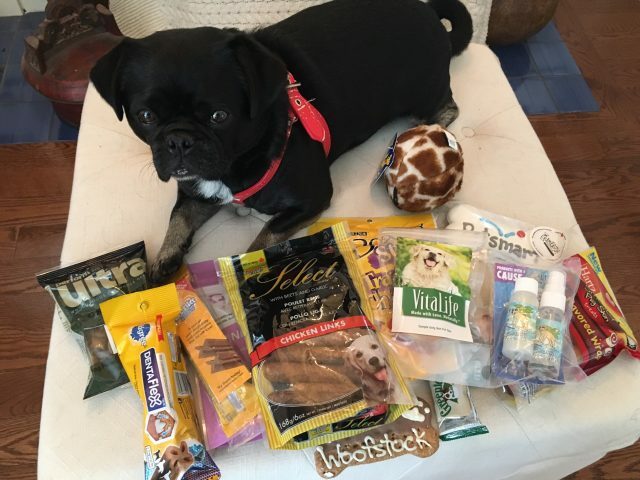 Kilo the Pug once stole and devoured a whole tray of dark chocolate and walnut brownies when we first fostered him. I rushed him to the vet and they induced vomiting and gave him a charcoal product. Thankfully he was fine. Then just last week, our house-guest Angus snuck a few bites of a block of dark chocolate he scavenged out of a backpack. Luckily for him, he threw up his breakfast and all the chocolate almost immediately (on the white carpet of course). We monitored him carefully for the next 2 days and he was fine. How much did they consume? How long ago do you think they consumed it? How big is your pug? What do they weigh? What’s so bad about chocolate? It’s delicious! 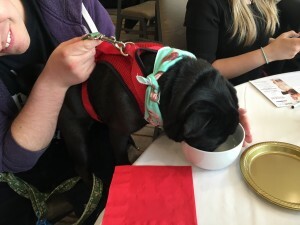 Although you may be tempted at times, the unfortunate truth that sharing certain human foods with your pug can be seriously harmful to their health. Whether your pug took a bite of your brownie or stole an entire cake, it can be helpful to understand just what is happening and what to do. Chocolate contains very toxic substances that are basically stimulants that can stop a pug’s metabolic process. 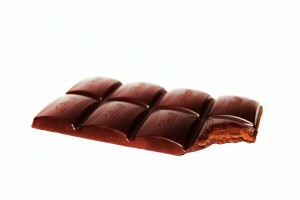 Chocolate contains substances known as methylxanthines -specifically caffeine and theobromine. These Toxic substances are in all kinds of chocolate, with dark chocolate containing the most and white chocolate the least. If your pug is showing any of these symptoms, then see your vet as soon as possible. 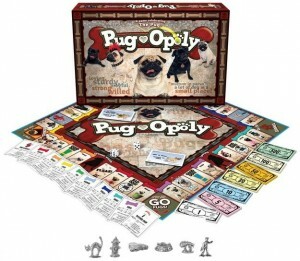 It’s also possible that if your pug has eaten chocolate they will naturally vomit on their own shortly after. 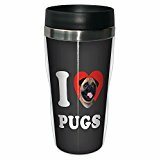 Generally, within the first couple hours after consumption, if your pug hasn’t puked, the vet will need to induce vomiting. 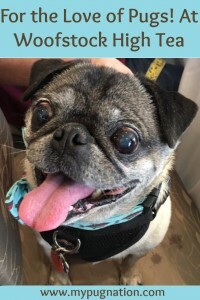 So it is crucial to get in to see your vet as soon as you realize your pug is at risk. And again calling the 24 hour ASPCA hotline can help you calculate that risk quickly. Nobody plans for these sorts of things to happen, but whether it’s the middle of the night and your vet is closed or not, the reality is that they do. 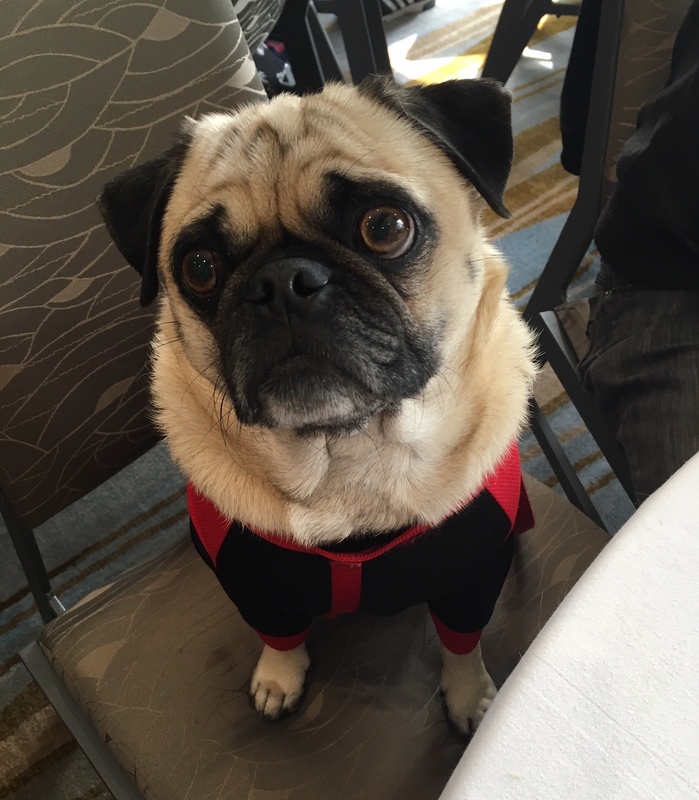 Keeping a clear head and taking immediate action can save your pug’s life. While researching for the Dog Licks Dog-Friendly Recipes, we looked for a Dog-Friendly Substitute for Chocolate and found Carob. You’ll be impressed with the benefits for dogs and humans. 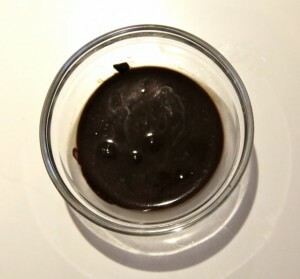 In fact, all of the ‘chocolate’ photos in this post are actually Carob! Carob is a chocolate substitute that can be ground into powder, melted or made into chips, just like chocolate. 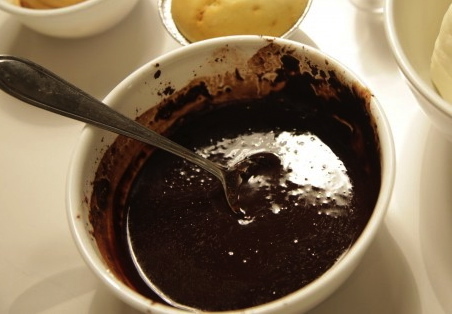 It has a similar rich dark brown color and naturally sweet flavor. It does not contain stimulants like caffeine, phenylethylamine or formamide, making it a great potential substitute for humans too. Have You Ever Had A Chocolate Scare With Your Dog? With the start of 2017 we thought it would be fun to wrap up 2016 with a round-up of our favorite dog-friendly places to take your pug downtown in our hometown. We wanted to try out the new Sony Action Cam we borrowed and film Kilo the Pug as he visited his favorite spots in The 6ix. See a product review for the Sony Action Cam here. 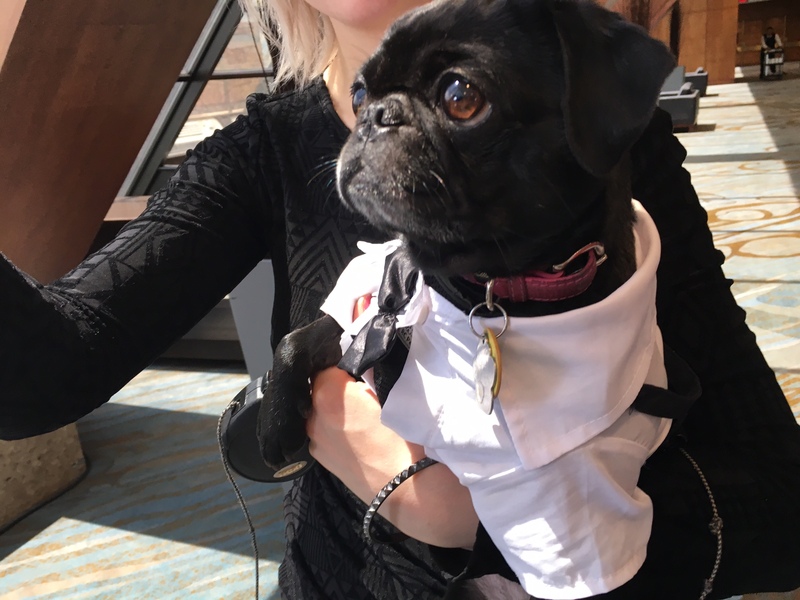 Toronto is a pretty inclusive city that has many dog-friendly spots perfect for people and pugs to visit. Whether you’re looking to enjoy the outdoors, take a walk, play in the park, shop or have a pug party, these are the best places. 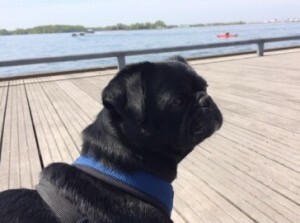 One of our favorite spots on the Toronto Waterfront is Purina PawsWay. They promote the well-being of pets by encouraging responsible pet care. Pet owners or those considering adopting can explore permanent exhibits, attend special events, participate in themed programming, do training workshops and discover the pet world. PawsWay is a Nestlé Purina PetCare initiative and is also the permanent home of the Purina Animal Hall of Fame. The pet-friendly place is perfect for events like the launch of Talent Hounds’ Rescues Rock TV series, PugALug‘s Pug Claus and other fundraiser parties, fashion shows like Strut Your Mutt, classes like agility, doga and puppy school and Rescue Adoption drives. 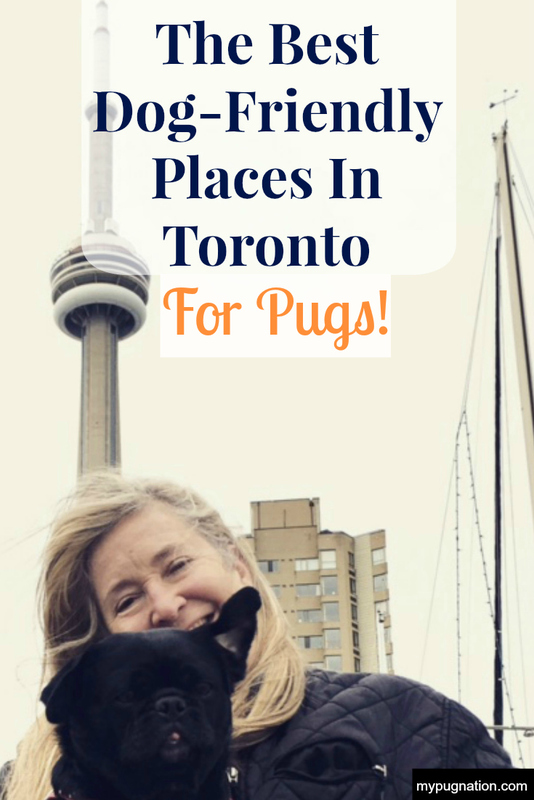 Toronto’s Waterfront is the perfect place for a walk with your pug in any weather. Toronto is home to one of the longest urban lakefronts in the world. From the Rouge River to Etobicoke Creek, the 46-kilometre shoreline has attractions ranging from parks, beaches, marinas to concert venues, art galleries, skating rinks and even a BMX park. 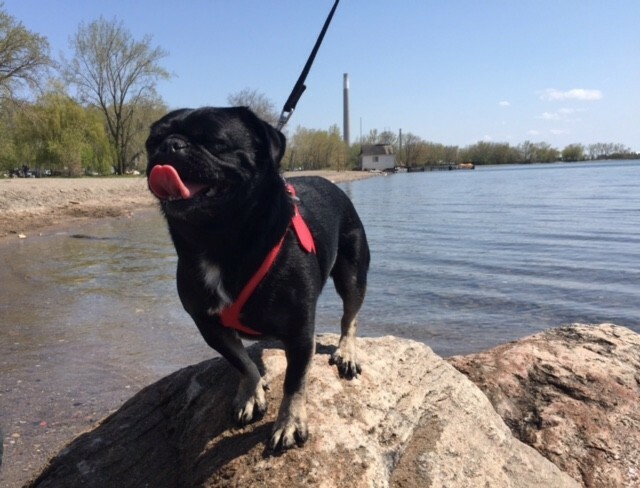 I love to walk with Kilo and see the Tall Ships, grab a coffee at the Starbucks in the Radisson Hotel or Williams Cafe in PawsWay and sit on one of the many lakefront benches or shop at the markets. Toronto’s Don Valley Evergreen Brick Works has been transforming public landscapes into thriving community spaces with environmental, social and economic benefits. The beautiful space is the perfect landscape enjoying nature, explore the wooded area and shop the farmers or garden markets. It connects with a huge network of ravines and parks to explore. Out of all Toronto’s pet-friendly hotels, nothing beats the historic 5-star Fairmont Royal York right in the heart of the city. 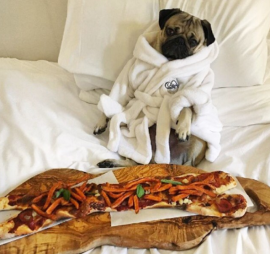 The Fairmont Royal York is a luxury hotel that often sleeps celebrities visiting Toronto like the King of Pop Culture himself, Doug The Pug. What’s better than having an amazing meal or delicious coffee? Being able to enjoy it with your dog. Tom & Sawyer -This place serves coffee and cold drinks for humans so you don’t have to tie up your best friend on the street, but its real reason d’être is to serve up freshly prepared pet food. We had our meeting on our 2 dog-related films “Music Rescues” and “Pippy Love” there just before Christmas and it was such a great ambiance. Williams Coffee Pub– located inside Purina PawsWay enjoy sitting indoors on the patio with your dog. Sassafraz– adored by celebrities, this Yorkville spot has outdoor seating that dogs are welcome to with a bowl of cool water. Trinity Bellwoods Park is a large public park located in the downtown west end of Toronto. It is a favorite place for local residents to walk their dogs. 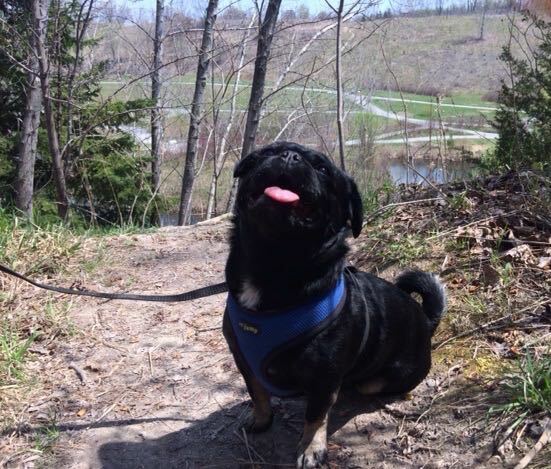 The ravine, known as ‘The Dog Bowl’, is the designated leash-free area for dogs to play. 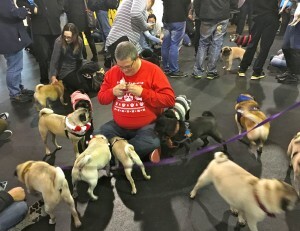 We attend the Toronto Pug Grumble hosted by our pal Helmut the Pug at The Dog Bowl. It’s the perfect place to host meet-ups for pugs to socialize and play. I have to say it was a bit frosty in December when we tried to film with the Sony Action Cam and so the turnout was low and I had a few technical fails. 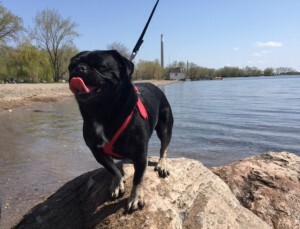 In the warmer month’s Cherry Beach’s Dog Park is the perfect place for pugs and owners to cool off in the water. 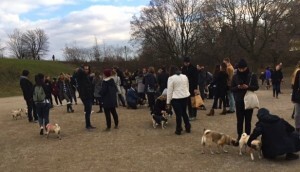 It has one of the largest areas of lakefront and beach of any off-leash dog park in the city. In fact, almost the entire West side of Cherry Beach is designated just for dogs. With the beautiful views of the Toronto skyline and of Lake Ontario, it’s a scenic experience for everyone. The park is large enough to really tire your pug out and is usually busy with a constant flow of dogs to meet and greet. Even unsociable Kilo loves roaming around with his dog cousins and humans there. 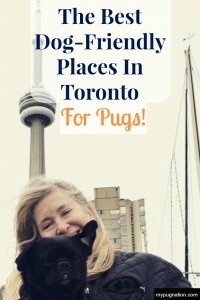 Have You Been To Any of These Places With Your Pug? Have You Seen Our Holiday Gift Ideas For Pugs and Pug Lovers? 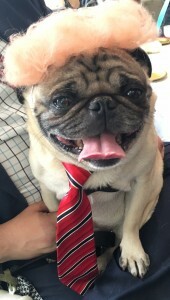 I love pugs and so do many of my friends since I adopted Kilo the Pug. 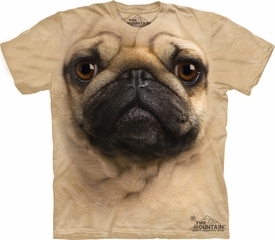 See our round-up of the best holiday gift ideas for that lucky pug lover in your life. 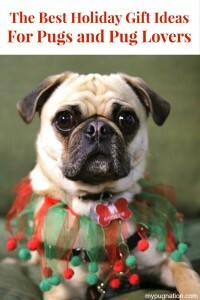 Donating to a local shelter of pug rescue organization is always a great gift option to consider. If you can’t donate money, they are always looking to supply donations, volunteers, and foster homes. You can also shop with companies that are giving back. 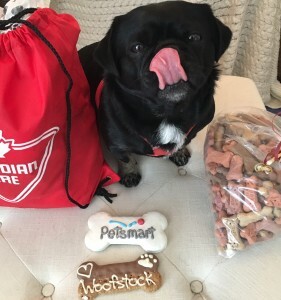 What Pug doesn’t love treats? 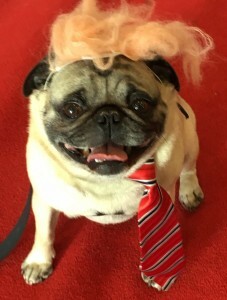 And a happy Pug is a Happy Pug Lover. 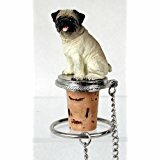 BUY this perfect gift for your Pug or the Pug Lovers in your life. 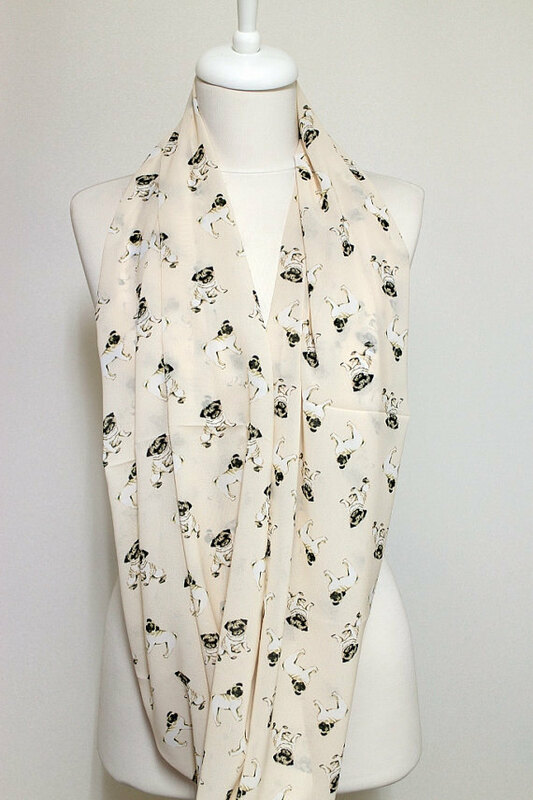 Reduced price of ONLY $39.99 plus HST and FREE shipping by clicking here by December 15th. 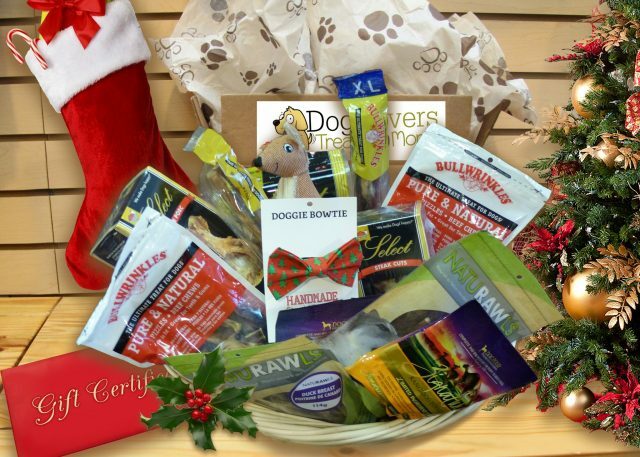 WIN This special Christmas Treat Box with an estimated value of over $200! Canada Only. Enter daily until December 15th, 2016. Kilo got a new one in the sample Holiday Gift Box but a Pug can never have too many bow ties and bandanas (or Bullwrinkles LOL). If you haven’t got yours yet order by emailing igorpugdog@gmail.com ALL proceeds to Pugalug Pug Rescue. We love ours. 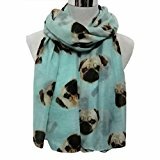 I got the pair with a black pug for myself and my daughter. 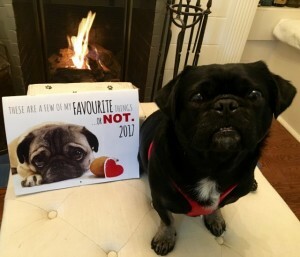 I got one at a PugALug Pug Rescue Event with a black pug’s face. They also have new t-shirts and I printed a bespoke one with Kilo’s face on it as well – Staples, Vista Print and other Printers are all offering personalized gifts. 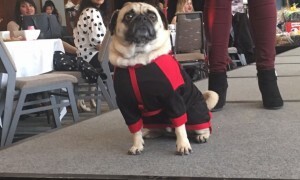 Plus I saw some fabulous Pug Slippers and PJs in one of the raffle gift baskets at the PugALug Pug Claus event. I bought lots of tickets but no luck so I will be searching online. 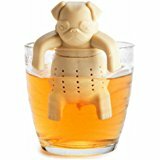 Tea Infuser– now that is a fun way to start the day. 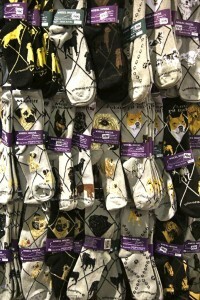 I really want some of these!!! I love my red wine so must have. We are lucky that talented Aria takes great photos of Kilo and our friend at Sadie and Co. did a beautiful painting of him which I LOVE. I also saw several great portrait painting options including My Pooch Face– we met at BarkWorld. I also saw that various printers including Staples and Vista Print are offering Cel Phone Covers and plan to order a Kilo version. I am also making some door hangers featuring Kilo. I also like the look of Custom Petsies plushes – I would love one of Kilo as I can never find a black pug plush. Crusoe the Dachshund’s looks so cute. 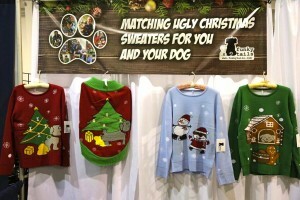 What will your pug or the pug lover in your life be getting this holiday season?